Search engines like Google, Bing and others are making efforts to bring searching for information in line with everyday conversation with a type of search called ‘natural language search’. This development is a move away from the type of searching that has dominated the web since the advent of search engines in the 1990s. It is part of an attempt to make searching faster and more effective by understanding searcher intent and more complex, multi-part queries. Natural language search is also key to a number of advancements currently taking place in technology, including voice search, digital assistants and smart home hubs. But what exactly is it, and how is it going to affect the way that we look for information online? Natural language search is search carried out in everyday language, phrasing questions as you would ask them if you were talking to someone. These queries can be typed into a search engine, spoken aloud with voice search, or posed as a question to a digital assistant like Siri or Cortana. This is as opposed to keyword-based search, which is what most people who are used to using web search engines still default to. Keyword-based search is an attempt to break down a query into the most important terms, getting rid of unnecessary connecting words like “how”, “and”, “the”, and so on. Natural language search has always been around – think of Ask Jeeves, the 1990s search engine which encouraged users to phrase their queries in the form of a question. But Ask Jeeves was ahead of its time; keyword-based searching was the norm then, and Jeeves found itself out-competed by more powerful keyword engines like Google. Several years too late for Ask Jeeves, search trends are coming back around towards natural language search. This is the result of a number of different developments in search and technology coming together. There’s a reduced patience for sitting and trying different keyword combinations; people are searching on their mobiles, on the go, and they want to be able to ask a question, get the answer, and move on. And search engines have worked hard to meet this expectation, so that people will feel satisfied with the service they provide instead of frustrated by it. Google recently published a blog post welcoming “complex questions” and illustrating how its search engine can now understand superlatives (tallest, largest, oldest) and “ordered items”, such as a list of the largest cities in a given state, in order of area. You’ll notice from the screenshot that Google doesn’t just aim to serve the right answer to that question, but to display it within the Knowledge Graph at the top of the screen, eliminating the need to even click on another site in order to find the answer. Amazon’s Alexa, Apple’s Siri, Microsoft’s Cortana, Google Now – these AI assistants are being adopted more and more widely, and their voice activation capabilities increasingly integrated into technology. The technology might have had its stumbling blocks at first, but as with Google, it’s improving steadily, leading people to become much more used to speaking commands and queries aloud in everyday, natural language and expect an accurate response in return. Will Oremus of Slate put the progression to natural language search best when he described it as a move from us speaking the language of computers in order to communicate with them, to us teaching them our language. As the world’s most popular search engine, it’s not really a surprise that Google is leading the pack in natural language search advancements. But it hasn’t been the only search engine to do so by any means. This works, and it’s quite impressive – ask Bing who the “President of America” is, and then in a separate query, ask “how tall is he?” and you’ll get the right answer, with the height of the First Lady and a couple of other presidents thrown in just in case. Of course, it depends on the first question being one that Bing can answer, which mostly restricts it to simple “who is…” or “how is…” questions. Still, not even Google, which always treats individual searches as a new query, can do this, and it’s a big step towards the kind of frictionless, conversational searches that natural language search aspires to. 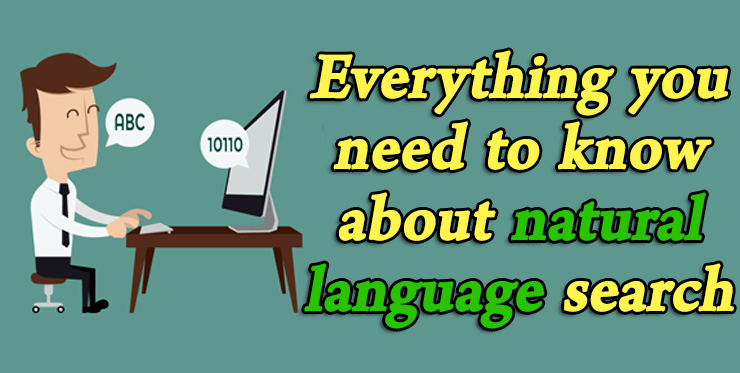 Newer search engines are also making natural language search capability their goal. Plonked, a niche business-focused search engine which launched in March, aims to provide its users with a natural language interface in order to keep up with the level of searching offered by Google and other major search engines. I also made an unexpected discovery when researching this article, which is that Ask Jeeves is not the only natural language question and answer service left over from the 90s. START is a “natural language question answering system” developed by the InfoLab Group at MIT, and it has been online since 1993. START functions more like a reference book than a search engine, designed to give factual answers to questions in fields like geography, science, history and culture. It also might be a little out of date. But it has an ability to puzzle out the different components of a complex query in a way that Google could stand to learn a thing or two from – and by the look of things, has been doing it for much longer than Google has. Where next for natural language search? We’ve published a number of articles on where Google is going with search, from using Hummingbird to better understand searcher intent, to employing RankBrain to guess at the meaning of never before seen questions, to making strides towards semantic search. Natural language search is bound up with all of these, since these are all capabilities that would allow Google to better interpret and respond to search queries in everyday language. So I think it’s fair to say that we can expect much better and more accurate natural language responses from Google as these algorithms learn, develop and have their limits tested. But as we’ve established, it’s not just about Google. There’s a possibility that we’ll see natural language search developing in a few different directions as Bing furthers its ‘conversational’ search style, and other search engines play to their own strengths. The kinds of natural language search queries that a niche engine like Plonked needs to interpret and respond to could be very different from those put to a general search engine, which could lead to some interesting advances in unexpected areas. There are even bigger developments taking place in the ‘digital assistant’ field, which is heavily tied together with voice and natural language search as digital assistants handle search queries along with a myriad of other tasks. Siri, Cortana, Alexa and others are all threats to Google’s dominance of search, and there are rumours that Google is planning to develop its own voice-controlled assistant device to take on Amazon’s Echo in the smart home space.